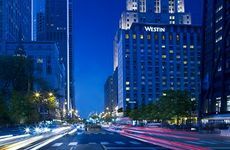 Find The Westin Michigan Avenue Chicago deals, discounts and special offers. The Westin Michigan Avenue is on the Magnificent Mile across from Bloomingdale’s and Water Tower Place. Magnificent Mile is at street level of the 343-room Four Seasons, featuring spectacular city and Lake Michigan views. With a 2001 opening, the Peninsula, across from Neiman Marcus, has a Shanghai Terrace and Peninsula Spa. A Water Tower Place location on Magnificent Mile, the Ritz-Carlton has a lap pool, spa, and 435 rooms. With a front entrance on Magnificent Mile, the 1920's Interncontinental has indoor pool, fitness center, & 790 rooms. The Monaco, in the Loop business district, offers free chair massages at it's hosted wine hour. Select rooms have Zune mp3 players & Xbox game systems; a Microsoft-driven lounge, Sax is at Marina City on the river. Enjoy butler service and magnificent views from a Deluxe Room at the Magnficent Mile Park Hyatt. In the heart of the Magnificent Mile, the Hyatt connects to the Illinois Center, offers wireless and atrium bar. Contemporary hotel with modern amenities in Chicago's Gold Coast area near Lake Michigan, shopping, and dining. Featuring spacious suites, a spa, & skyline views, smoke-free Renaissance is downtown on the north edge of the Loop. Sweet Sleeper beds await guests of this downtown hotel's 1209 guestrooms & 40 suites; health club & internet available. Newly renovated 632 rooms, at the convergence of Lake Michigan & Chicago River, Swisshotel has a large event center. A European-style boutique hotel located on Chicago's Gold Coast, Talbott has wifi, & access to health club. A landmark building in the Chicago Loop, walking distance of Millennium Park, the Alise Chicago is 100% no-smoking; free wifi. A Chicago River-front location central to downtown, the smoke-free Westin offers 407 rooms & suites, & workout room.